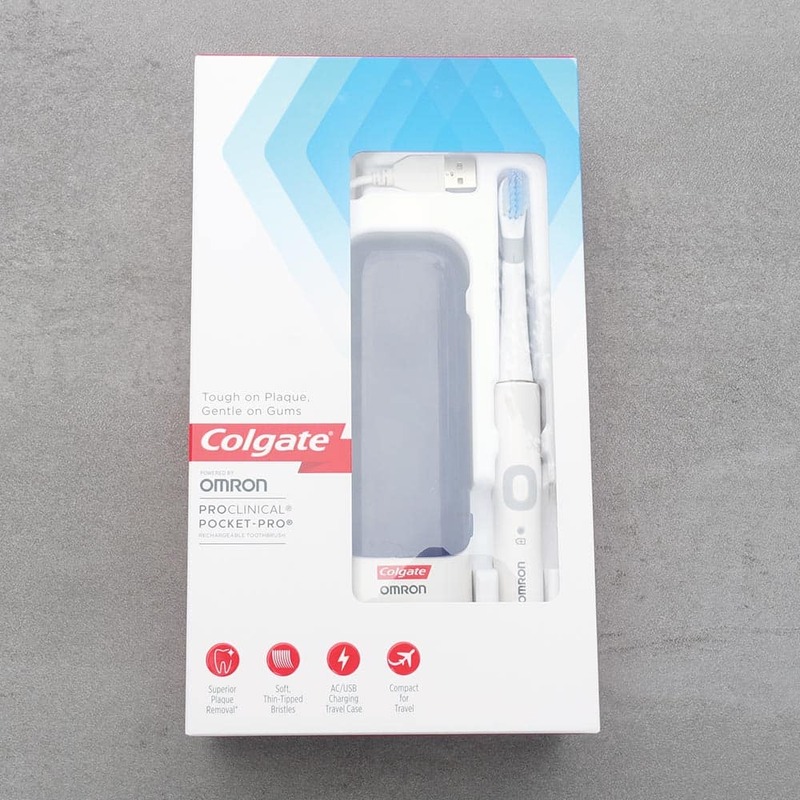 If you are short of time, the answers to the following 3 questions should let you know all you need to about the Colgate ProClinical Pocket-Pro electric toothbrush. If we have missed something, let us know in the comments. 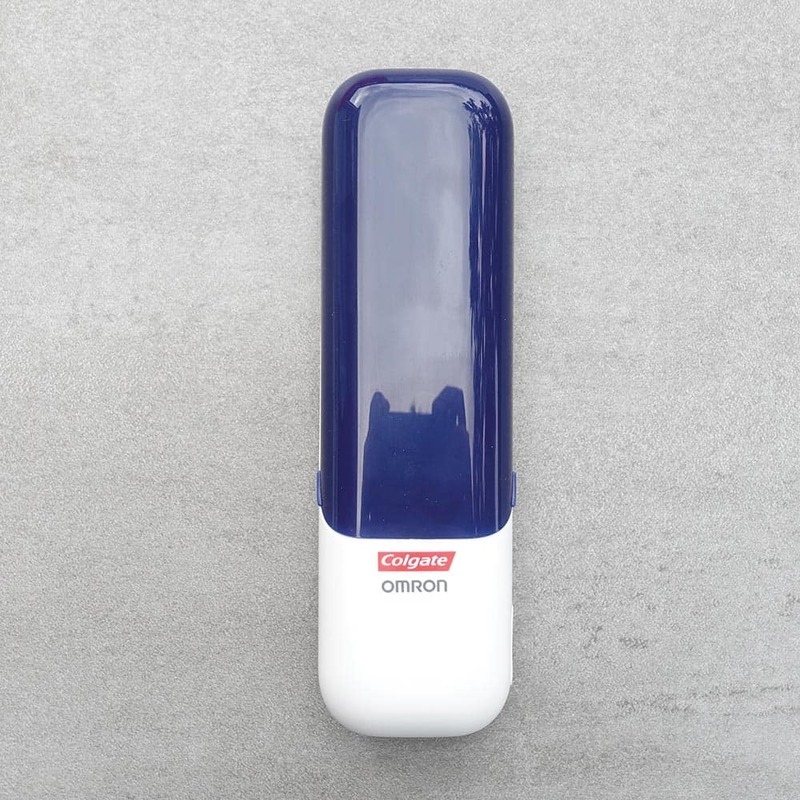 This is a compact and impressive toothbrush option that is particularly appealing to travellers. There is little in the way of anything being wrong with it, unless you are really picky! It might be nice to have some more features and cleaning modes but for the price this is a fantastic option. We have given a rating of 5/5. If you are a regular traveller, that needs convenient on the go charging, then look no further this is a solid choice. It takes the top spot for best travel toothbrush. For those not always on the road, than as good as the Pocket-Pro is, the Colgate ProClinical 250+ is a much better value purchase. And if you are not stuck on Colgate, Oral-B’s Pro 2 2500 is a solid choice too. 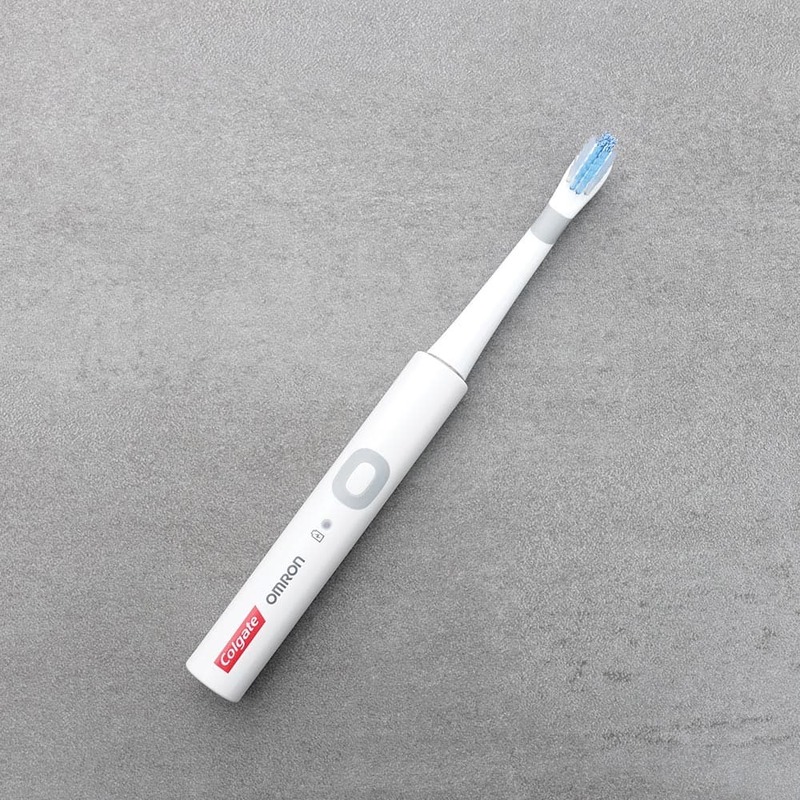 For a broader look at the market, see our roundup of the top electric toothbrushes for 2019. 3. Where is the best place to buy the ProClinical Pocket-Pro? There is not necessarily one ‘best’ place to buy the Pocket-Pro. Colgate are stocked by a good number of different retailers including Superdrug, Asda and Debenhams. However, we have typically found that Amazon offers the best prices and delivery times. Be sure to shop around and be comfortable with the retailer you buy it from, cheapest isn’t always best but of course it is very compelling! Here are the Amazon links to three brushes we would choose between if you are considering the Pocket-Pro. 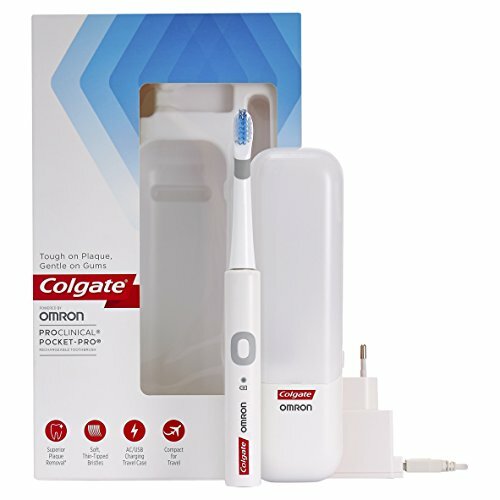 Perhaps the traveller’s dream electric toothbrush, I don’t think I have come across such a great value, strong performing brush that is also compact and protected for travel. Essentially the Pocket-Pro being reviewed here is the ProClinical 250+ which I reviewed previously, repackaged to include a charging case rather than a charging stand. 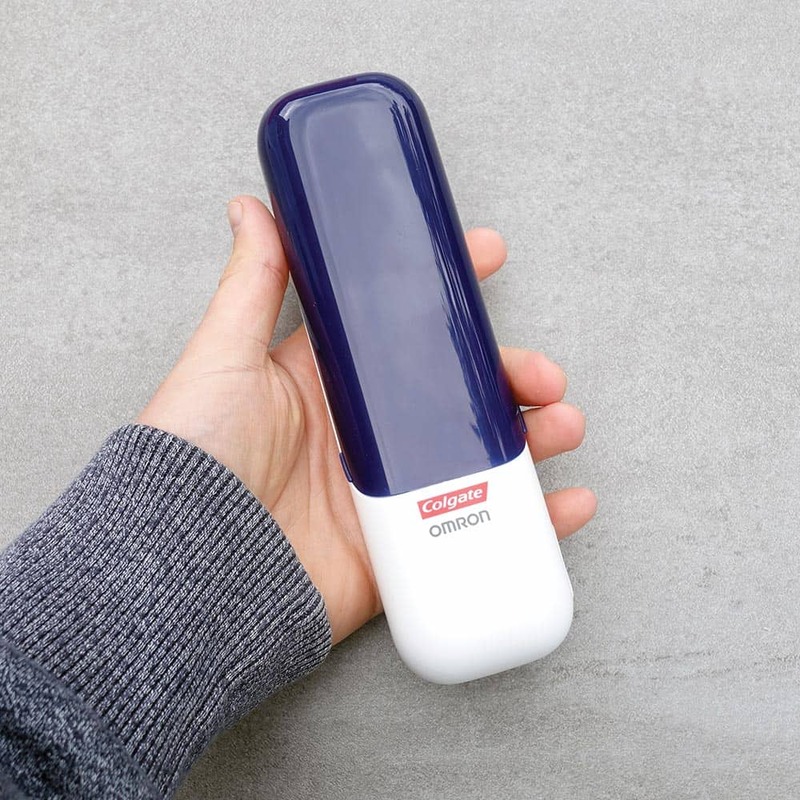 Gone is the slim travel cap that goes over the 250 instead you get a bigger, thicker and more robust case that allows the brush to be charged in the case. There are 2 variants of this brush, the 2 different variants are different coloured models. One is Black whilst one is White. The box contents is the same though as are all the features. With the White model the brush handle is a slightly off white, with a colour matching brush head, travel case with opaque lid and colour matched charging cable and mains adapter. The Black colour option has a black travel case and brush head, but the charging cable and mains adapter are white. Please note – Our review sample came with a Blue lid to the travel case as opposed to the normal opaque white you would normally get with the White coloured brush handle. Manufacturers will always sing the praises of their brushes, but normally we will find a criticism or deficiency, few are perfect for everyone. The ProClinical is no exception but it has to be one of our most highly rated, there is just so many positive elements. Slim and lightweight design – Only when you handle this brush do you appreciate just how slim and light it is. It is almost like handling a manual brush. Great for adults and kids alike. Travel case – Although not the most compact the case is smaller than Oral-B or Sonicare equivalents. Powered off a microUSB connection is can charge the brush in the case. A provided mains adapter supports global voltages too, 100-240V. Different colour options – Available in White or Black to suit your preference. 1 cleaning mode – A simple easy to use single cleaning mode makes for a fuss free use. A cleaning mode that lasts for 2 minutes & turns itself off when complete. With the included head up to 5 times more plaque can be removed compared to a manual brush. Battery life – Some 14 days of use is possible from the battery. 28 cleaning sessions lasting 56 minutes. Impressive to say the least. Design – So slim, those with limited grip and dexterity may struggle to hold. A rubber grip would not go a miss. The clean – Personal preference, but don’t get quite the same punchy fresh feeling of cleanliness as with Oral-B brushes. Still cleans very well. Features – Other cleaning modes or box additions would be nice but hard to grumble when considering the price. 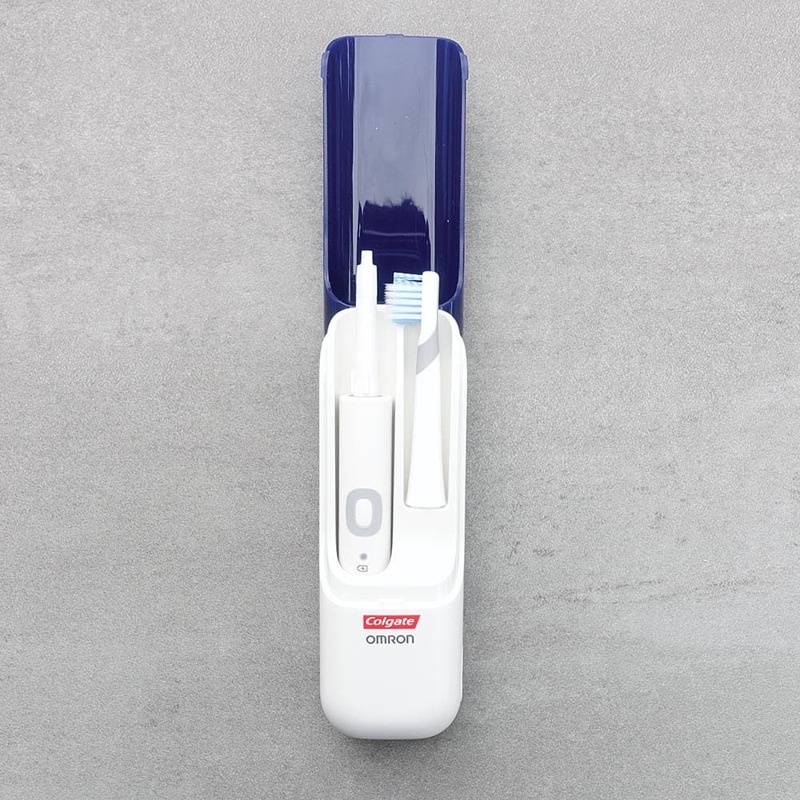 The Pocket-Pro offers everything that you need of an electric toothbrush and a bit more. If the nation went out and purchased this, the population as a whole would have much better oral health, but I don’t suspect they will as not all see or are aware of the benefits of an electric toothbrush. The Pocket-Pro offers quite a few features you would not expect of a brush of this price, the travel case is a neat and sophisticated inclusion and really rounds the product offering and I do believe makes this a much more attractive option for many people today. Let’s start by looking at the design of this brush. I am sorry to say, the brush handle is boring to look at. It’s quite dull compared to some of the more colourful and smarter looking handles from the competition. It does come in either a White or Black colour option but still the design is, well a bit plain. BUT, it is very functional, a simple no nonsense approach, it would just be nice if it was a bit more jazzy to look at. The extremely slim profile of the handle is too a blessing and a curse. It is amazing how this brush offers so much given how slim it is, but it is also harder for those with limited dexterity to hold onto and there are no grips to the handle. The body of the brush is rounded and smooth to the touch, with the slight exception of a rubber ring around the power button. Such a slim design and weight means this is not heavy to hold and is nearly as light as a manual brush. On the front of the handle is one single power button, battery status icon and brand logos. On the back at the bottom is a small panel with some regulatory information. The base has a recess into which the charging pin in the provided travel case fits. Compared to similar brushes from Oral-B and Sonicare the Pocket-Pro wins hands down for size and portability. Aside from the Colgate branding on this brush you will also see Omron. This may or may not be a name you are familiar with, but they are a well established brand in the healthcare space. The two companies have worked together on the ProClinical range in an effort to become a reputable force, producing quality toothbrushes. Omron help more with the technical aspect of the parts of the brush and the science whilst Colgate brand, market and distribute. A single brush head is included. It would be nice to have more, but considering the price it’s more than justifiable. That single, user replaceable head is the Triple Clean option. It has spiral bristles to help remove surface stains, inner bristles to remove plaque from teeth surfaces and tapered outer bristles to clean along the gumline. The brush head pulls on and off and you have the choice of 4 different head styles. There is the included Triple Clean, a 360 Deep Clean, 360 Whitening and Sensitive head (sold separately). If you want to know more about them, just take a look at the ultimate guide to Colgate brush heads page. Overall the size of the brush head is smaller than most manual brushes making it easy to position and manipulate the brush within the mouth, particularly in the harder to reach areas at the back of the mouth. With any toothbrush, the head should be replaced every 3 months. The Pocket-Pro is no exception. All brush heads from Colgate fit every model in the range and do too have indicator bristles. These are blue bristles that fade to white over normally a 3 month period to act as a reminder to change your brush head. A point to note, is that although the Pocket-Pro comes in Black and White colour options, when it comes to buying replacement heads, the White ones are more readily available. The Black ones tend to be harder to source I have found. So if you think the black coloured handle is for you, just bear in mind you might have to attach a white brush head after the provided head has worn out. For me, my personal daily toothbrush is one from Oral-B. I prefer the post clean feeling. It sounds extreme but the clean feels harsher and leaves my mouth feeling fresher and I like that. The Colgate ProClinical Pocket-Pro feels a little softer and more sensitive in its clean. I have no hesitation in suggesting that the Pocket-Pro can clean your teeth very well and will leave you feeling good post clean, but if you are already used to Oral-B and are thinking of switching, you might notice a difference. If you are not used to an electric toothbrush or you are thinking this could be your first, then I think it would be an excellent option as you do not have this comparison to make. A single press of the power button will turn the Pocket-Pro on and launch the 2 minute long Clean mode. Another press of the button will turn the brush off. There is only one cleaning mode on this brush, which makes it nice and simple and easy to use. When running, the clean mode delivers up to 30,000 sonic vibrations per minute to the brush head which moves in a variety of directions and can achieve up to 5 times more plaque removal than a manual brush. You might be aware that many electric toothbrush come with timer and pacers built in. This helps ensure you brush for the right amount of time. Once powered on at 30 second intervals a pause in the motor and in turn the brush bristles, alerts you to the need to change quadrant, for an even and effective clean. After 120 seconds have passed the clean ends automatically and the brush turns itself off. Whilst dentists recommend a 2 minute clean, if you want to clean for longer you can. Simply power the brush back on. Do be aware too much time spent cleaning your teeth can be damaging too. Longer cleaning times will also mean you get less days usage from the battery. If noise is an issue, maybe you clean your teeth at night when others are asleep, then the Pocket-Pro has you covered. The brush emits a strong vibration and a gentle humming sound. It is quieter than Oral-B brushes which produce more of a mechanical sound. If you have used a Sonicare brush the sound of the motor and the vibration is very similar. The Pocket-Pro will stand upright, but the lack of weight to it means it can easily be knocked over. When in the case, it will not stand upright. On the mention of the case, let me explain this a little more. Whilst some brushes come with no travel case at all, others come with largish, thin plastic shells that hold the brush and a head and nothing more. The Pocket-Pro is a really great solution for travellers on long trips or for those who tend to do short business trips. The case works in two ways. Firstly it protects the brush and then head when travelling. The case is rounded with a flip lid that clips closed. The case is nice and rounded and is not excessively large and feels as small as it can be given what it offers. It feels pretty robust too. Exert some extra pressure on it and you can tell it is not as rigid as those cases with the more premium Oral-B Genius and the Sonicare DiamondClean, but then you do have to pay a lot more for these. Secondly then, it allows the brush to be charged in the case. 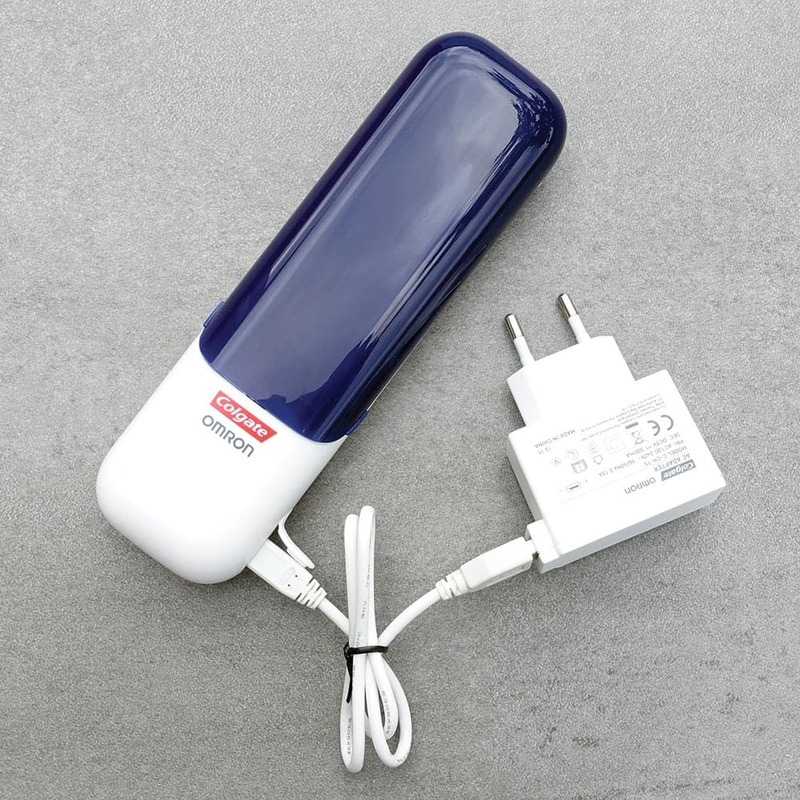 There is no charging stand supplied with this brush, you dock the handle in the case and connect the provided USB cable. On the right side of the case is a rubber port cover that when opened reveals a microUSB port. Supplied in the box is a microUSB to to USB cable, connect this to a USB port or use the the mains adapter and you can charge the brush in the case. The 2 pin adapter provided has a USB socket on it and works on 100-240v, meaning international travel with this brush is simple. You may need a plug adapter, subject to where you are travelling. For those tight on space when travelling, if you smartphone is powered by microUSB you should be able to use the same power adapter. It takes up to 10 hours to charge and the LED on the brush handle will light up red when connected to power. Some sort of venting in the case would be useful to dry out a brush head, but I am really getting picky here! The brush itself is water resistant rather than waterproof. This means it will survive life in a wet bathroom and exposed to moisture from the mouth but avoid having the brush reside in water and to prolonged exposure to water. I have no doubt that if you pick this brush you will be extremely surprised by what it offers for the price, but should you not be sure or have some doubts, it is handy to know that Colgate offer a money back guarantee. This is not well marketed and really only on properly taking a look at the box will you see this offer. What this means it that you to try the brush and return it for a full refund of the purchase price (excluding shipping) if you are not happy. You have 30 days from the date of purchase to try the brush. If you do not like it, send it back within 45 days from date of purchase, providing you have all the original packaging as well as the original receipt. Details of how to go about this are included in the manual but for your convenience read our article on the Colgate Money Back Guarantee for the key facts. And should you then keep this brush, you can use in peace knowing you are backed by a 2 year warranty as standard. Try as I might to find fault, there is very little to complain about. The things I have are rather nitpicky too! You could get a more feature rich, more premium feeling brush, but you will pay for it. The Pocket-Pro is a cracking product all things considered. This super slim little brush offers a very impressive 2 weeks of battery life. I really struggle to comprehend how such a small brush offers such when you compare to the much larger Oral-B models etc. Sadly Colgate do not make clear through their marketing materials how long it lasts for, but we have tested it and found that the brush functions for 56 minutes. Based on 2 x 2 minute cleans each day that is 14 days of usage. Such a battery life is undoubtedly helped by the automatic power off at the end of the cleaning cycle. 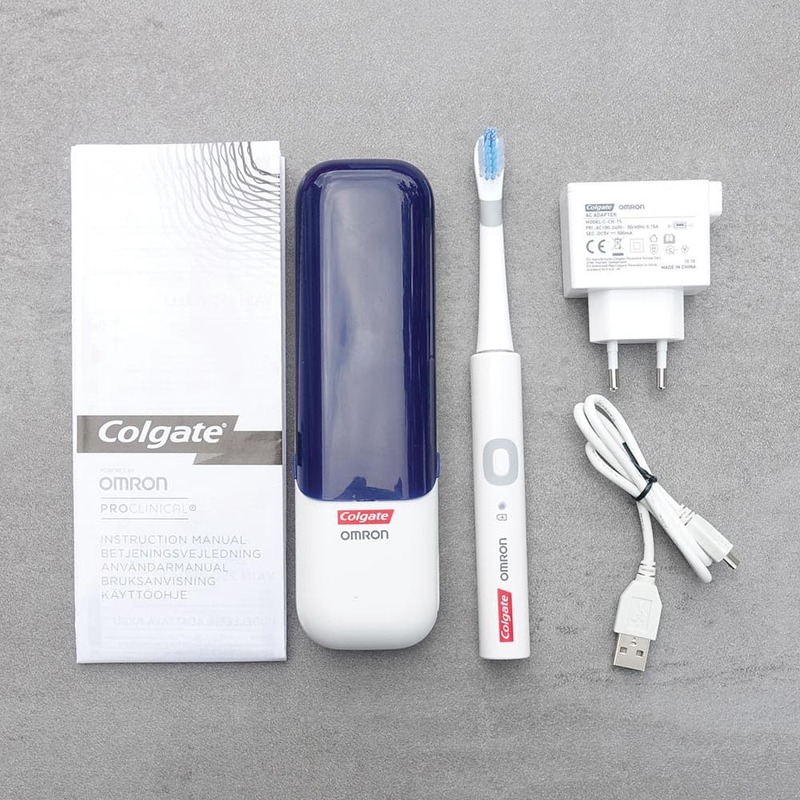 Colgate is beaten by Philips Sonicare that have brushes that achieve 3 weeks, but they are though, larger in hand and probably have a physically larger battery. With 2 weeks usage time this is more than enough for most and will even last those who are going away for a week or two on holiday, but if you do need to charge it is lovely and simple to do this. The Pocket-Pro is a dream brush for travellers, because all you need do is detach the brush head and slide the handle and head into the provided case. This case replaces the typical charging stand you might get with a brush. It’s a 2 in 1 solution, travel case and charging dock. On the lower right side of the travel case is a microUSB port under a rubber flap. Connect the provided microUSB cable to to the case and the full sized USB connector at the other end to a USB port or to the provided power adapter and begin charging the brush. It will take up to 10 hours to charge the brush fully. The Pocket-Pro can be charged via a laptop USB port, a power bank or a USB wall socket. The quickest charge is likely to come via the mains adapter that is provided. A 2 pin charger, it is a tad bulky but inside it does have all the necessary technology to allow the adapter to work on 100-240V, which is excellent for those who really travel. If you do not have the original charger/cable to hand you could always use any other microUSB cable/power adapter, but where possible use the original. For those who really need to travel light, maybe your phone is charged via microUSB and the charger could be shared?! 2 pin USB socket provided compatible with 100-240v. The RRP of this brush is £65. This in itself is actually not too expensive when you consider the alternatives. It is slightly higher than I would have hoped for but it is arguably justifiable given the travel case, but it gets better. Some retailers do stick to this RRP, but prices for this brush have been less than £25 from time to time and it is relatively common to see this brush retailing for much nearer £30. Price is always subject to change but our research indicates that you need not shop around too much to find it at a more wallet friendly price. In many respects this is leaning towards the budget end of the scale when you consider the most feature rich brushes can be well over £200 but you are getting a lot of brush for the money and for a larger proportion of the population this offers all you need and a bit more. Quite honestly, those retailers and even Colgate are undermining the value this brush delivers when the price is so low, but you should just take this as a little life win and not complain. You are getting a deal. The Pocket-Pro like any other electric toothbrush requires replacement brush heads for each user every 3 months. Replacement heads can be purchased in packs of 2 or 4 and are priced on average between £10-£19. Generally speaking the 4 pack is more cost effective and many retailers sell the Triple Clean brush head that comes with the Pocket-Pro for around £10. This gives a per head cost of just £2.50. Using the average cost (based on one user) and ownership over 3 years, the Pocket-Pro will cost £57.50 or 5p per day to own. 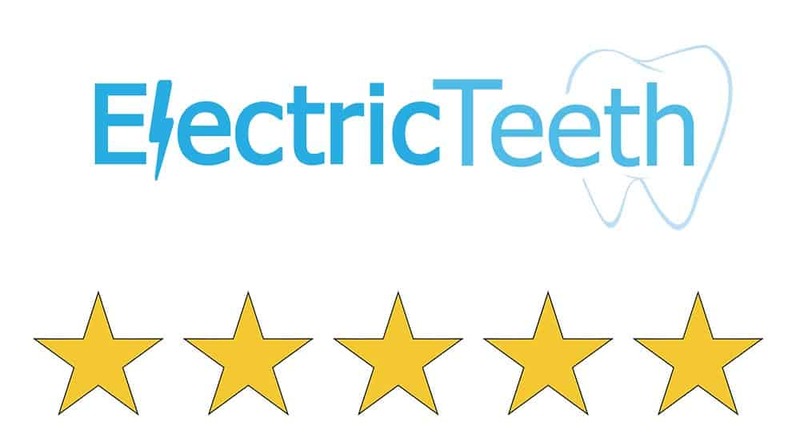 As best as possible here at Electric Teeth we like to know that things are going to stand the test of time and our aim is to test the electric toothbrush in a way that you would use it at home. Lab tests or durability tests are not something we do and it is not possible to test every toothbrush day in day out and report back on how they fare. However we take reliability seriously and always comment on where we think weaknesses are and should we ourselves see over time a brush failing or not performing as it should, be assured our reviews will be updated to reflect this. Colgate are a well known brand and from the hands on I have had with their brushes the quality and reliability appears to be extremely good. There are very few complaints that readers let us know about too! Sonicare brushes tend to feel more premium, but you often pay a lot more, so this is all relative as some may say. However, whether you are paying £20 or £200 you expect certain levels of quality. I can say that with the Pocket-Pro you can expect a more than satisfactory build quality and reliability. The weakest point is the rubber cover over the cases charging port and the overall strength of the case. Neither are going to break after a few uses, but the case could be slightly stronger and there could be a little more play on the rubber cover, but trust me there are not big issues. Should you be disappointed on initial impression you do have the 30 day money back guarantee. Do be aware the Pocket-Pro is water resistant so it can get wet and be wiped down with water but it is not waterproof so where possible avoid prolonged exposure to water to avoid doing damage. Supported for a 2 year warranty should the brush fail, but I suspect it will serve you for longer than this. If you do want more information, read our Colgate warranty page. I am so impressed with this brush. It might well be the Colgate 250+ repackaged with a smart travel case, but this makes a difference, for those who need it. The 250+ on its own I rated 4 out of 5, but the Pocket-Pro just adds something, particularly when priced competitively that makes it more than worth the price tag and comfortably scores 5 out of 5.
Colgate have a well thought out, strong performing product that in reality offers something that is not currently available unless you spend a lot more money. In case charging might be a small thing, but for a select number of people this is incredibly desirable. All this said, if its not on sale at the low price, for those ho don’t need the travel case, the 250+ is a better value deal in most instances. Is the ProClinical Pocket-Pro an oscillating brush? How many brushing modes does the ProClinical Pocket-Pro have? 1 cleaning mode for your standard clean. It lasts for 2 minutes and uses sonic technology to pulsate the bristles of the brush head and clean your teeth. No, there is one cleaning mode only. The Pocket-Pro comes supplied with 1 brush head, Colgate’s Triple Clean brush head. You can also purchase a Sensitive, Deep Clean and Max White One as an alternative that will work with the brush. Does the ProClinical Pocket-Pro have a pressure sensor? Does the ProClinical Pocket-Pro have Bluetooth? Does the ProClinical Pocket-Pro have sound connectivity? Does the ProClinical Pocket-Pro come with a warranty & how long is it? Does the Pocket-Pro have a built in timer? The battery lasts up to 56 minutes, which is equivalent to 2 weeks or 14 days of usage based on 2 x 2 minute cleans per day. Yes, it is a charging case into which the handle and brush head sit. A microUSB charging cable is used to charge it. Can I use the ProClinical Pocket-Pro in the shower? Yes and no. The Pocket-Pro is water resistant, meaning it should survive trips in the shower, but it is not waterproof and the continued exposure to water in a shower may have an effect. Ultimately it is not advised. Yes. The brush handle and head detach to slide into the case separately. The brush can be charged in the case. Do you own or have you used the Colgate ProClinical Pocket-Pro? The ProClinical Pocket-Pro brush spoken about in this review was provided by Colgate’s PR department. Electric Teeth did not purchase this model. No financial reward was provided to conclude the review the way that we did. Interesting site. My pocket pro as just died. So looking to replace it, I trave a lot so the being chargeable from USB is a great feature. From your reviews I’m going to try a 250+ in the charging case and see if it’ll work, from what I’ve read here it should.